Albert Einstein defined "INSANITY" as "doing the same thing over and over again and expecting different results". He has also been quoted as saying, "You have to learn the rules of the game. And then you have to play better than anyone else." I do not know about you, I have done the over and over thing and I mark it down to experience and avoid it at all costs. Learning the "game rules" however, is something that experience also teaches you. This aspect is well worth learning and using. It then becomes a matter of using the game rules to your advantage. The insanity I am referring to is the misappropriation of the future tenant's actions on the date of the executed lease and orchestrating the tasks and activities of many individuals prior to rent kicking in (typically) three months later. Rarely, is the 3-month period sufficient time to accomplish all of the activities required to open the doors prior to paying rent. Yet the execution date of the lease is typically the date this insanity keeps repeating itself to both experienced and new business owners, franchisors and franchisees. Why do they keep doing this to themselves? This failure to act prior to an executed lease can have a great financial impact. The free rent period ends and you are not open to pay rent from your sales, but instead from your pocket. How deep are the pockets? Sound all too familiar. Why do these business folk keep repeating this scenario? The reasons for the delays are many and here are the top culprits. The promise of construction documents being completed, did not happen, the building department took too long (and issued comments that were bizarre), the construction also took excessively long and cost big dollar changes and lastly, the client is not at fault. In this article, I wish to offer alternatives, my clients and I have developed to avoid the insanity of believing the free rent period is sufficient time to open your business. It is a detailed schedule of activities implemented prior to an executed lease. To explain this process it is best to explain it in reverse. Therefore, the starting point is the moment you have a fully executed lease and work backwards in time. Think of it as a Quentin Tarantino movie. Reviewing it this way allows you to retrace your steps and prepare for the next time. Here are some of the questions you need to ask yourself and how much time was truly unproductive. What would have been the cost savings in comparison to the rent payment at the end of the free rent period? 1. How long did it take to get the "signed executed lease" from the property owner? 2. When did you sign the lease and how much time did the property owner require to find the 12 signatures to sign the lease? 3. How long did you hold the lease before accepting the conditions, signing it and sending to the Landlord?Consider this, what activities could you have accomplished with this time! 4. How long did it take attorneys to make revisions once both sides said," finish the lease"? This list can go on and on, as many of you know. The point being there are weeks, that you are not taking any inexpensive actions. The first of these actions is to include the architect early on. I am not self-promoting; keep reading to start challenging the myth of the architects costs and technical knowledge. Their services early in the process can identify methods to reduce the construction costs and insights of the space to provide negotiation tools to offer up to the property owner. Once you have decided to negotiate with the Landlord, request your architect to walk the site. The architect should know your requirements prior to arriving at the site with the knowledge of how much electrical service is required; the required amount of air conditioning; plumbing requirements, occupancy load etc. The architect can then decipher for you the existing conditions of the site and which upgrades to request of the property owner. The information you gather at this time can provide a negotiated saving to offset some or the entire architect's fee or more. Obviously, this works better on 2nd generation spaces, however, the same principle holds true when you ask for more electric service, HVAC, plumbing, delete sheet rock work to tenant separation walls and much more on 1st generation spaces. If you have an ongoing relationship with the architect or the franchisors franchise architect, they should offer this service at no cost. Should the franchisors architect need to come in from out of town, do not panic. In addition to the negotiation information the architect would provide, the franchisors architect should perform all of the existing field investigation while on site. This information will substantially decrease the time to prepare the construction documents, by weeks! Based on an existing space of up to 1,800 sf, it should not be more than $1,500.00 -$2,000.00. To this point, you have saved potentially 2 weeks of rent. 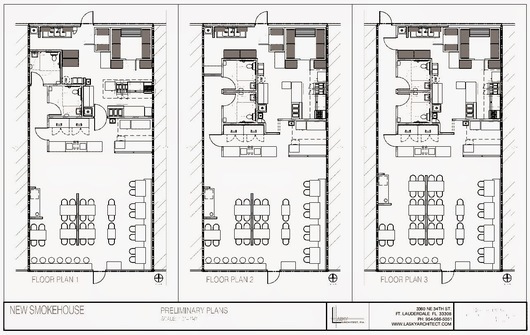 The next step to utilize this time prior to the lease date is move forward on schematic design drawings. If the franchise is an established concept, they already have all of the information needed. I like to call these concepts, plug & play. Knowing franchise requirements indicates minimal decision-making. You assemble all of the franchise-required components into the leased space as if it was a puzzle, knowing where the edges are. Even though it sound like a no brainer, there are always alternative ways to put the puzzle together. This usually takes a week to reach a schematic approval sign off, but can be longer due to field conditions and other issues. The reflected ceiling plan would also be designed at this time and approval requested. The cost for this service will range from $1,500.00 - $2,500.00. This cost spread is dependent on the type and complexity of the franchise concept. So now, you have saved a week plus a little that is not time used up during the free rent period. On average, the activities described can have a net savings of a month. Otherwise, without a "pay to play" attitude, based on a typical three-month no rent lease, your remaining time would be two months. Would the two months be sufficient amounts of time to complete the construction documents, permitting, contractor bidding and construction? Think about it and save some money.